As I may have mentioned before, I have a 7-month old baby girl who is delighting in her new found love of solid foods. This time around I'm trying to make more baby food at home. Now that I'm getting the hang of it, I'm finding that it's really quite easy. Today, I discovered a new blog called "Once A Month Mom," where these two mamas, Cortney & Tricia, give you a plan for cooking once a month. Yes, you heard me! One time per month. They provide a menu complete with 10-15 breakfasts, 10 lunches, 15 dinners for two families of four. WOW! They also have a 4-6 month cooking day schedule for baby food, which includes a menu of sweet potatoes, apples, carrots, peas, green beans, potatoes, bananas, pears, peaches. If you've never made your own baby food before, this post has a great step-by-step instruction guide. You could even have a baby food party with a few friends if you're so inclined. Some baby foods contain as much sugar and saturated fats as cookies or cheeseburgers, a British food pressure group said on Monday. 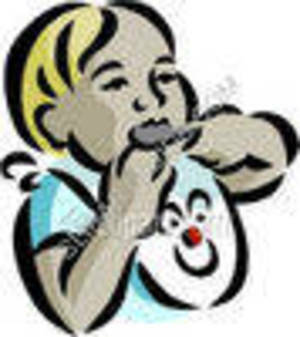 Publishing results of a survey of more than 100 foods for babies and toddlers, the Children's Food Campaign said Farley's rusks were 29 percent sugar and some Cow & Gate toddler biscuits contained trans fats, which have been linked to heart disease. Click here for the rest of the story from the Today Show this morning. Ina, a.k.a. The Barefoot Contessa, always knows how to dish out the comfort food. With the pending election and credit crises, they say that Americans are looking to comfort food to weather the storm. Here's a recipe for what looks to be a lovely vegetable soup that the whole family will enjoy. And who doesn't love a recipe that uses leftovers from another meal?! The recipe doesn't mention it below, but Ina put in the leftover roasted vegetables from the previous night's dinner along with her leftover salad with a garlic vinegarette (I've always wondered what to do with leftover salad!). Genius. In a large saucepan, heat 3 cups of chicken stock. In 2 batches, coarsely puree the roasted vegetables and the chicken stock in the bowl of a food processor fitted with the steel blade. Pour the soup back into the pot and season, to taste. Thin with more chicken stock and reheat. The soup should be thick but not like a vegetable puree, so add more chicken stock and/or water until it's the consistency you like. Place the chickens, onions, carrots, celery, parsnips, parsley, thyme, dill, garlic, and seasonings in a 16 to 20-quart stockpot. Add 7 quarts of water and bring to a boil. Simmer uncovered for 4 hours. Strain the entire contents of the pot through a colander and discard the solids. Chill the stock overnight. The next day, remove the surface fat. Use immediately or pack in containers and freeze for up to 3 months. 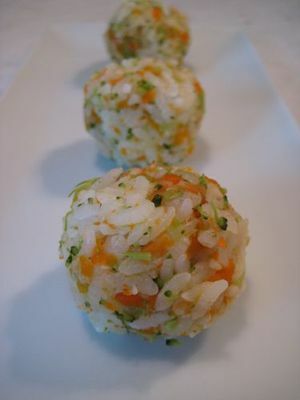 Cut the carrots, parsnips, sweet potato, and butternut squash in 1- to 1 1/4-inch cubes. All the vegetables will shrink while baking, so don't cut them too small. Place all the cut vegetables in a single layer on 2 sheet pans. Drizzle them with olive oil, salt, and pepper. Toss well. Bake for 25 to 35 minutes, until all the vegetables are tender, turning once with a metal spatula. News Alert: "Momma, I'll Have Some of Whatever You're Having"
With Baby #2, I'm definitely going to try this method of feeding. You'll hear much more about my experimentation in about 7-8 months from now! A PALATE IN PROGRESS Some adult meals, when put through a food mill, may appeal to babies. Ever tried quinoa? If so, ever had it for breakfast? This deliciously light pseudo-grain makes a quick and yummy breakfast cereal. Did I mention that it is gluten-free? For all my gluten intolerant friends, I know how much you struggle with breakfast options so now you can add a new one into the rotation.
. It has been cultivated in South American Andes since at least 3,000 B.C. and has been a staple food of millions of native inhabitants. The ancient Incas called quinoa the "mother grain" and revered it as sacred. Technically quinoa is not a true grain, but is the seed of the Chenopodium or Goosefoot plant. It is used as a grain and substituted for grains because of it's cooking characteristics. Rinse quinoa and add to water and orange juice. Bring to a boil. Reduce heat and simmer for about 5 minutes. Add cinnamon and continue to cook until all water is absorbed. 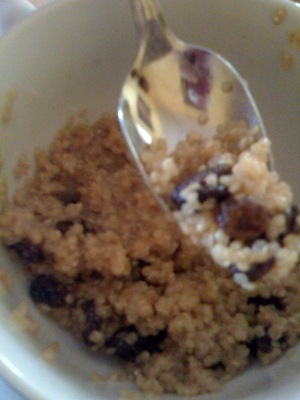 Top with raisins and serve with milk / cream and brown sugar / honey to sweeten if desired. Here's a great primer on finger foods with the majority of the information coming from Kellymom.com, which is a fantastic resource especially for breastfeeding moms. I've compiled a list of ideas for what to feed your baby when they are ready for finger foods. When your baby's between 7 and 9 months old, he'll probably let you know that he's ready to start feeding himself — by grabbing the spoon you're feeding him with or taking food off your plate. How chunky can the food be? If your baby is not gagging & choking on the food, then the texture (table foods, etc.) is fine. Watch carefully the first few times your baby tries a new food to make sure she can handle it without gagging or choking. Always supervise your child when she is eating finger foods. Warning: Steer clear of finger foods (including nuts and dried fruits) that may be choking hazards. Also, highly allergenic foods may not be suitable for babies under a year or who have a family history of allergies. Want to find the safest drinkware for your toddler? 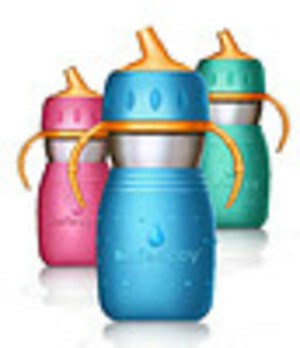 Thanks to the tip from my mommy friend Tracy, I discovered the ZRecommends blog, where they featured the safe, BPA-free sippy cups in last November's BPA Report . Also, here's a BPA-Free Bottle and Sippy Cup Cheat Sheet from blogger SafeMama. if you're busy like me and your head is spinning with all of this BPA in plastic news, I'm grateful for those that can break it down and tell me what to buy and what to toss. Today, Zrecs also did a round-up of the Best BPA-Free Water Bottles. As a part of your spring cleaning, take a sippy cup inventory this month and make sure your toddler is sipping from the finest of sippies. Tonight's featured recipe idea inspired me to create a new category, "Meals on the Go." Especially since many of us parents are constantly racking our brains for portable meals. I thought this was such a great idea to feed an older baby or toddler on-the-go. It's from one of my new favorite blogs, Weeliscious. Can't wait to make these, wrap'em up and take'em to the beach or zoo or picnic. After all, summer is almost here!